Note the contact areas. 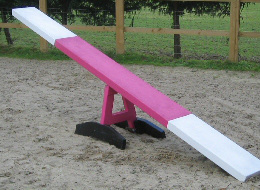 The seesaw should touch the floor before the dog comes off it. Florrie on her way down to "touch" on the dog walk and Murphy in training on the dog walk. Dylan on the dog walk. Note the “contact” marked with white which he must touch with at least one paw. The A frame stands behind the judge on the right of the picture. 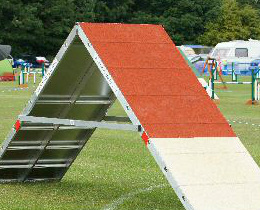 Hurdles: Can be one or two poles and poles and boards and can be height adjusted. The pole will fall off if the dogs legs touch it. Tunnels: Come Flat or rigid. Rigid tunnels must be run one way or the other as indicated by the number placement. If the number is placed in the middle the tunnel can be run either way during the course. Often 6 or 12 weaves are included. There can be an odd number (anything between 5 and 12). 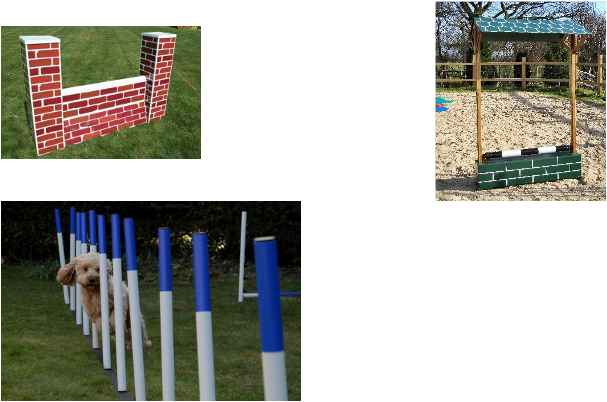 A Jumping Course can include all obstacles except the contact obstacles. 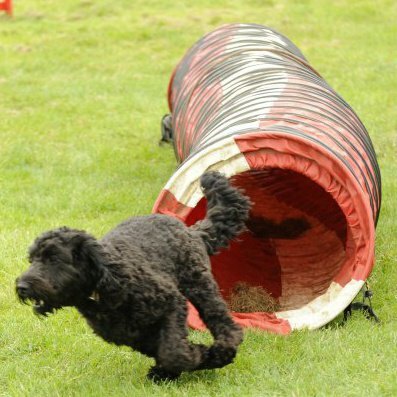 There are other types of course defined by the different agility organisations, such as helter skelter, power and speed etc. Check out the links page for more information. www.agilityclub.org - A KC agility club to join where your points accumulate for your own club, you get a magazine The Voice.